UPick6 opened their Tap House at 333 State St. Tim Schnars II and company headed down to see what the buzz is all about. A few years ago, I challenged American beer connoisseurs to embrace their duty as "ambassadors of rebellion" and dethrone the "king." In the years since, the craft beer segment in America has consistently grown by double-digits annually. Today in the U.S. virtually every style of beer imaginable is available. Not only have we recreated foreign beer styles with accuracy, we've developed our own styles and have become exceptionally adept at brewing. No longer is American beer derided as being similar to making love in a canoe. American beer culture has become pluralist, artisanal, and edifying. It's time Erie gets acquainted with the new foundations of this cultural revolution. With the rise in the popularity of higher quality beer, so too has come a change in consumer's habits. Nowadays, people have become more apt to buy a six-pack, 22 oz., or 750 ml. bottle of craft beer as opposed to purchasing a case of craft beer at a higher price point. They're thinking in terms of quality and not quantity. 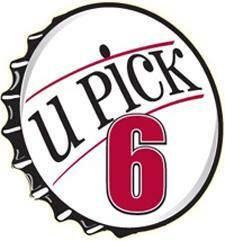 Upick6 on upper Peach Street became a causal reality in response to this niche of distinguishing beer drinkers. With the inception of the Upick6 Tap House, owners Russ Stachewicz, John Melody, and Tom Brasco are not just catering to a niche, they're creating one. The Tap House is exactly what it sounds like. Its main focus is the sale of artisanal draft beer, and it's the only one in town with twenty-two handles yet none devoted to domestic macro beers. Though its twenty-two taps (and cask ale) are the main attraction, its menu isn't merely an afterthought. Recently the editorial staff of the Erie Reader and I were invited to an exhibition of their gastronomical talents at a private beer and food pairing. On approach to the corner of Fourth and State streets, you might see patrons seated at a sidewalk patio outside what used to be a vacant plot at Modern Tool Square. The windows are filled with neon beer signs, tin tackers, and retired hand-drawn pumps used for serving cask ales. The interior exposes an extensive breweriana collection with attention to defunct local breweries, and a layout motif of handcrafted brick and wood coupled with modern convention. A support beam brandishes street signs and a portion of the west wall has sliding glass windows to serve the State Street patio. Intermittent in the dining area are wooden pews, and behind the taps is a brick arch—both reminiscent of an English pub's feel. Over near the bar is a lounge area with leather couches, adjacent to a second outdoor patio located inside the courtyard of Modern Tool Square. Dual chalkboards are utilized to alert patrons of available beers and a multitude of high definition flat screens carrying the NFL ticket adorn the walls. Though sports are not a major influence, bartenders can be discerned from the wait staff as they wear soccer-style Upick6 jerseys. The atmosphere evokes a sense of warmth, welcome, and conviviality. Upon arrival, managing partner Tom Brasco introduced us to the staff and began priming us for our tasting. Brasco and executive chef Jordan Eback lent themselves as provisional Cicerones, taking turns describing the beer and the cuisine. Chef Eback warns us, "Just don't call them pepperoni balls. ", whilst introducing the first pairing, pizza muffins with Augustijn Belgian Tripel. After listening to him describe his method of creating over-cured dough yeast and biting into these light, fluffy, grease-free delicacies, I can attest that they are indeed not pepperoni balls. Their breadiness imparted itself quite well to the yeasty, estery characteristics of the tripel. The pizza muffins appear in three versions (cheese, mushroom, and pepperoni) with the savory mushroom variety being my favorite. A quick once-over of the beer list and menu can lead to indecision for anyone who loves variety. Selections on draft often include local, seasonal, imported, limited release, and nitrogenated beers. The Tap House also has a burgeoning collection of bottled craft beer. Front house manager Shawn Beale explained that bottled beer facilitates the desire for consistency amongst out-of-town travelers and people who just plain don't enjoy draft beer. They also carry a nominal selection of wines, spirits, and domestic macros. The menu does have pub-grub like hot dogs and burgers, but decidedly draws from the same artisanal inspiration as the micros and imports that grace its taps. Dishes conceptualized for the menu are derived from a fresh-food basis, and believe it or not, the Tap House has no deep fryer. Chef Eback mentioned that the menu may expand to include entrees and possibly focus on seasonal ingredients. Another pairing was chicken pesto flatbread with Warsteiner oktoberfest. The flatbread arrived on a cedar plank with visible slices of chicken, tomato, and fresh mozzarella dabs. The Warsteiner's soft malt and noble hop aroma keenly complimented the chicken and basil pesto. We followed with their Strawberry Fields salad and Abita's Purple Haze raspberry wheat. The spinach, strawberries, candied walnuts, crumbled goat cheese, and fresh-prepared raspberry vinaigrette harmonized with the fruit beer, creating a crisp, refreshing fruitiness with feral cheese notes on the back end. The atmosphere at the Tap House feels like a fusion of metropolitan and traditional with idiosyncratic homage (including a portion of the original Dickson tavern's bar) adding a sense of nostalgia, absent of kitsch. Katie Hanlin-Stachewicz, the Tap House's advertising and marketing director, describes their mission as being, "to deliver a unique, new experience." They shun pretension and have a genuine desire to incorporate education as part of their services, inviting ordinary people and not just beer geeks and aficionados. When asked how they view potential competition, such as Jekyll & Hyde's, they explained that they weren't competitors but cultural allies, analogous to the attitudes found in the craft brewing industry. Our next pairing was their "signature" sandwich with Voodoo Brewery's Gran Met. Their signature, with Buffalo chicken, smoked Gouda, and roasted garlic mayonnaise on ciabatta is a flavor bonanza in itself, let alone paired with Biere de Garde. The candy-sweet, estery Belgian-style ale complemented the sandwich's inherent complexity. Even the accompanying potato salad wasn't two dimensional, incorporating Red, Idaho, and Yukon Gold potatoes. We finished our tasting with Boulder Brewing Mojo IPA on nitrogen paired with their carbonara pizza. The nitrogenated Mojo had a straw gold appearance with fine bubbles and a grassy, skunky/cannabis aroma. Prepared with Alfredo sauce and an egg in the center, the buttery creamy flavors of the pizza's pancetta, prosciutto, provolone and fontina cheeses conformed to the IPA's smooth mouthfeel. The Tap House staff has had a little more than casual training with what amounts to more than a few hours of "beer school." This includes the ability to make suggestions to craft beer novices and they readily offer samples of everything they serve on draft. The staff pays strict attention to glassware, being sure to match up beer style with the appropriate glass type. It may seem trivial, but it really does enhance the perception and experience of beer, to the extent that some Belgian and American breweries have developed different glassware for every beer that they make. In recent weeks, I have tasted many beers on draft at the Tap House that have never been in Erie before or have only been available in bottles previously, an affirmation of their mission. After spending a measure of time with the people behind the Upick6 Tap House, you come away with a sense that they have a vested interest in craft beer culture. The Tap House's motto is, "We're all about BEER," but in truth it seems that they are also about quality, in selection, and service. They are explorers and stewards of a quality-centric movement, expanding the horizons of this big-little city. They are a new breed of American publicans, who've created in their own image, a new American public house. Is it time to put an end to the two-party system? Already known for their great food and craft beer, Jekyll & Hyde's gets a major upgrade with a new tap room. The history of brewing beer is a storied one. Tim Schnars II calls for a return to our origins. From the Heavy Kevy to the Colonel's Cocoa Crude Chocolate Stout, Tim Schnars, II found himself at home-- in Titusville. Spring is in the air, and in the beer. Tim Schnars gives us an introduction and a lesson in beer appreciation.